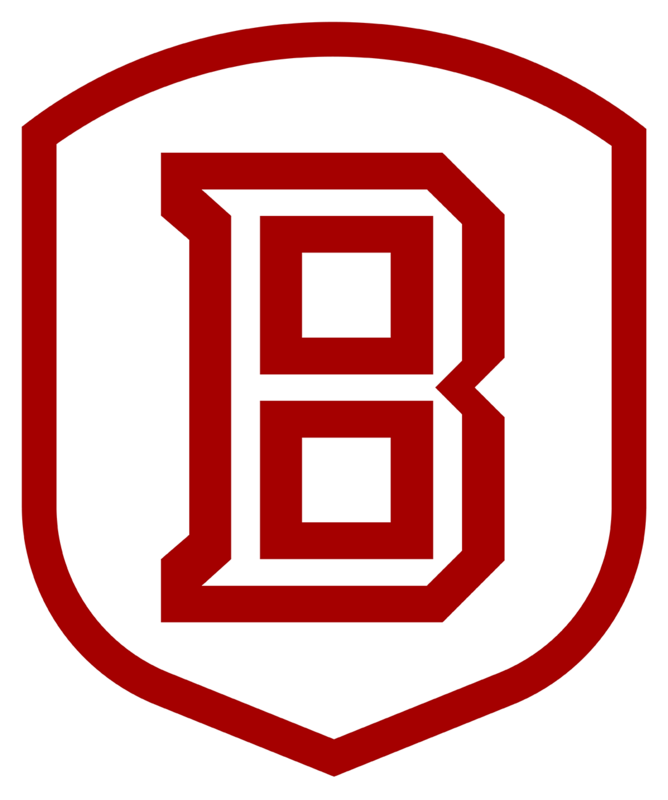 In an effort to participate in the energy revolution and push the limits of its applications, Bradley University has launched its first solar car senior project. The eight man team consists of four electrical engineering students (Caleb Happach, Evan Krueger, Jake Ruiz, and Joshua Strong) and four mechanical engineering students (Kody Downes, Aaron Green Van-Zee, Zachary Pakula, and Trevor Peterson). With advisement from senior staff including Dr. Brian Huggins and Dr. Jeries Abou-Hanna alongside assistance from Prof. Steve Gutschlag, the students are working to design and implement a solar car prototype with the ability to be upgraded by future teams with the goal of competition viability in only a few years. The Formula Sun competition consists of two main races. The first is a two thousand mile endurance race across the country that occurs every even numbered year. The other is an annual closed track race located in a different state every year. The competition rules mandate requirements that must be met before any car can enter the competition. These include a battery pack weighing no more than 40 kg, a frame capable of withstanding a 5G collision from any direction, and a top speed of 60MPH. A full competition car has to go through many stages of inspections including turning tests, braking test, safety checks, slalom test, and a battery test. Braking capability must exceed 4.72 m/s2 and the turning radius must be, at largest, 8m. The systems and components chosen for the prototype vehicle will be designed as close to race standards as possible so that components, mounting locations, and control schemes can be implemented into a race capable vehicle with minimal need for modification, and to allow the reusability of various components. 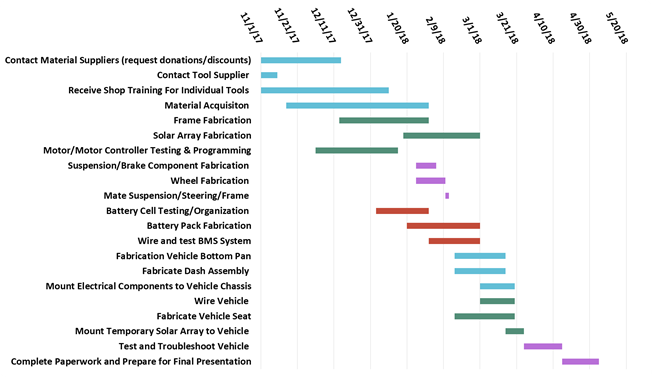 The components used during the construction of the prototype vehicle will be chosen based on available funds and donations, with emphasis given to reusable components where possible. The vehicle’s electrical system will be designed as close to race standards as possible while operating under a limited budget. By doing this, future team members will be able to review the prototype systems and implement more efficient system components. The electrical system will consist of a lithium-ion battery pack, a battery monitoring system, solar charge controller, solar array, motor controllers, DC in-hub motors, and a vehicle monitoring system. The prototype vehicle shall be designed to run under solar and battery power as a proof of concept for the vehicle systems. Figure 1 shows the block diagram for the major components of the vehicle and who is responsible for them. We will test the vehicle by simulating the EPA standard dynamometer drive schedule as closely as possible. The specific model will be the New York schedule. This include eight stops throughout the test at a max speed of 25 mph. The motors that have been decided to be used is the 3000W kelly hub motor. This is a Brushless DC three-phase motor. The nominal voltage for these motors are 48V. The reasoning behind using a 48v motor is because of the lack of available solar charge controllers. We have found it difficult to come across solar chargers that boost the solar panel voltage up to the battery voltage. However, in the future, it would be beneficial to use a higher voltage system to minimize energy loss through heat with lower currents. These motors support regenerative braking and have a max efficiency of about 82%. Some of the other motors that we considered included the Mitsuba in-hub motors. These are extremely light and efficient. The reason why we didn't go with these is because of the price tag of about $10,000 a piece. As for acceleration, the only requirement is to be able to stop at a rate of 4.72m/s2. The motor controllers that we will use are the kelly KLS4840D which is also made by kelly. This is to ensure proper compatibility with the selected motors. These controllers are made to operate with the 48v hub motors. They also support regenerative braking, which has a maximum efficiency of 50 percent. Each controller supports 140A continuous and 350A burst. This is more than powerful enough to constantly power the motors. The plan is to purchase these controllers in a kit. This would provide us with the proper connectors, as well as relays we can use to isolate the controllers. Another reason why we chose these controllers is because of the CAN bus communication. This means we can control the controller with the Orion BMS and adding an extra layer of protection for the battery pack. These controllers are also programmable so they will monitor the current, motor temperature, and voltage. If any of these parameters are broken, the controller will adjust the output to the motors to protect the battery and motors. The battery pack will be constructed from Li-Ion 18650 Cells. Lithium Ion cells have a nominal voltage of 3.6v, a max voltage of 4.2v and a minimum voltage of 2.5v. Going above the max or below the minimum will damage the cell and decrease the capacity. As a cell gets used, it goes through cycles. 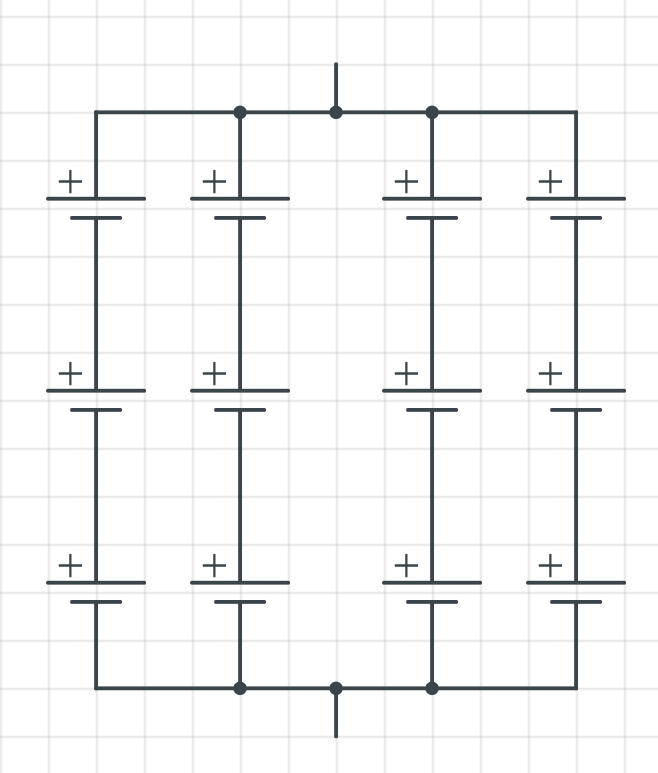 A cycle is considered when a cell is at full charge (4.2v) and gets discharged down to the minimum (2.5v). The cells are the LG HG2’s because of their high energy density (3000mAh) and LG is a more reliable manufacturer. This is important because there are manufacturers that distribute cells that are either used, or labeled with different capacities than what they really are. Although you can never get a cell that is chemically the same as every other cell, you can get pretty close. Buying from a well known manufacturer, like LG, ensures we are getting quality cells. These cells also support a 20A maximum discharge per cell. Although these cells do not have a specific lifespan, the datasheet does show that the capacity decreases as the cell goes through cycles. 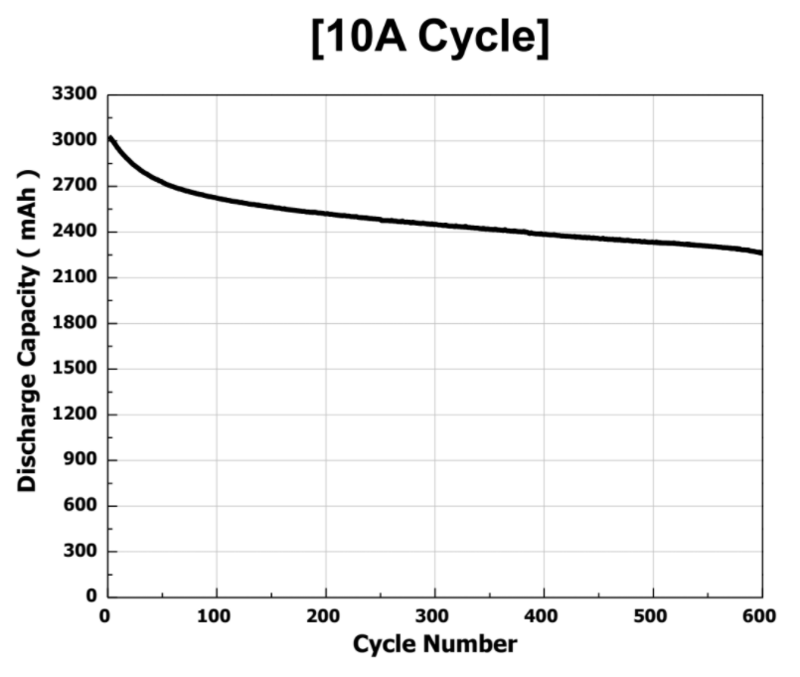 For example, when cycling the cell at 10A, the capacity drops down to 2200 mAh after 600 cycles. See figure 6. Capacity also depends on how the cells are discharged. According to the datasheet, the capacity drops to 2100mAh at 600 cycles when discharging the cell at 20A. From the capacity and internal resistance, we can determine the health of a cell. A high capacity and low internal resistance would indicate a healthy cell. Temperature of a cell impacts the health of the cell. When a cell gets cold, the internal resistance increases, but permanent damage can occur when the cell get too hot. We will be configuring them together so that the battery can supply the required 48 volts to the motors and have enough capacity to drive around campus. Our battery configuration is designed to resemble figure 2. The BMS we have chosen is designed to monitor the battery in this configuration. When we purchase the cells, we will have to cycle every cell and determine what the capacity and internal resistance is of every cell. This will allow us to pick which cells to put together to make our parallel clusters. This will also show faulty cells, should there be any in the batch we get. Lithium ion chargers are voltage limiting and have high tolerances because lithium ion cells cannot be overcharged. The charger will appropriately increase the voltage and limit the current, decreasing it until it reaches a specified voltage and current. Lithium ion cells also cannot be stored at their fully charged state. For long-term storage, they should be stored at their nominal voltage. The battery will be housed inside a fireproof electrically insulated box with adequate ventilation to keep the cells cool. The battery management system will monitor all inputs and outputs, as well as the status of the battery pack. This includes output power to the motor, and input power from both the PV array and motor controller (from regenerative braking). The battery management system will monitor voltage, current, and temperature of each battery cluster (highlighted in red in fig. 2), and also have the necessary safety systems should a failure or breach in parameter occur. The BMS we are considering is the Orion BMS, designed for 36 clusters of cells in series. It will monitor each cluster, and in addition it can perform intelligent cell balancing, calculate state of charge, and calculate current charge and discharge limit. It has analog outputs to interface with gauges and displays for the driver, and digital outputs that can interface with the solar charger and motor controller to enable or disable those systems based on the status of the battery. The Orion BMS will also handle most of the data acquisition. It has two CANBUS 2.0B interfaces, which allows 10 parameters to be transmitted periodically. These messages can be transmitted to a central microcontroller such as a Raspberry Pi. It is likely that we will have a central data processing unit that will handle data acquisition. This data will be recorded for analysis as well as interfaced to the driver using LCD screens. This data will also be used to create a more accurate model for energy consumption. That can then be used by future teams to learn from so they can improve the prototype and make it ready to compete, as well as help future teams when Bradley is ready to move on to an entirely new car. The solar cells provide the source of electric energy to maintain/charge our battery pack. Solar cells are wired together to create a solar array or panel. For our car, our array can be up to 4 square meters in size. The panels that we decide to use will be mounted to our frame. Our two main options are to design our own custom array or purchase pre-made panels. We are only looking at monocrystalline cells due to their cheaper price for their performance. If we design our own array, it will give us the ability to customize the array, but will require a lot of research and testing in order to reliably create our panels. Solar cells are very fragile when they are not sealed. We also have a few different choices for the solar cells. SunPower or VIKOCELL solar cells. The differences between these choices come down to price and efficiency. The SunPower cells are more efficient, but also cost a good deal more than the VIKOCELL cells. The other option is to use pre-made panels that can mount to the frame and plug right into the charge controller. The main panels we are looking at for this are HQST 100W panels. We think our best option would be to go with the pre-made panels at this point because it will be cheaper and easier than making our own custom array; however, we would also like to test our own design because it could help future teams when they design the custom array to mount to their aeroshell. To determine the amount of energy from the area of solar cells, we used the average solar insolation for Peoria, in May. This would be the approximate time we are planning on testing the car. Using solarenergylocal.com, we determined the Global Horizontal Irradiance. This is the energy from a surface that is always positioned horizontally. See figure 4 for the graph of solar insolation over the year, in Peoria. The other lines in the graph, DNI and ATaL, stand for Direct Normal Irradiance and Average Tilt at Latitude. DNI is based on a surface that is always perpendicular to the sun and ATaL is based on a surface that is tilted towards the equator at the angle of the latitude. We chose the GHI because the solar cells will be in this position when installed on the car. The solar charge controller is designed to convert the power generated from the solar array and use it to charge the battery. There are two types of solar charge controllers: MPPT and PWM. 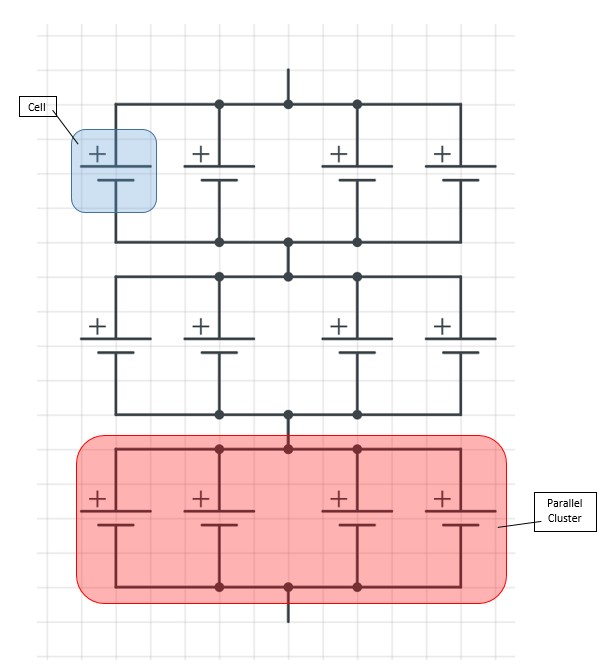 PWM controllers use the voltage from the solar array and modulates it accordingly. MPPT controllers are more sophisticated than PWM controllers, in that they adjust the input voltage from the solar array to harvest the maximum power before converting the input voltage to the required storage voltage. The option the team has chosen to go with is the MPPT charge controller. MPPT controllers can adjust the output voltage and current to properly charge the battery. This is more efficient because the energy from the solar array is passed through to the battery. If the voltage must be raised to meet the battery, the current is brought down. Since we are running 48v motors, we would need a 48v solar array to be able to use a PWM charger. Because of the maximum allowed area for a solar array, we cannot obtain a voltage that high. Thus, we would need to use the MPPT charger to boost the voltage, from the solar array to match the 48v battery. The two models that we have come across are the Docooler and the GENASUN solar charge controllers. The Docooler controller allows for a 48V battery to be charged with a lower voltage input from the panel. The GENASUN supports only a maximum of 48v on the battery. The reason why we would consider going with this is the fact that it is of a higher quality and is specifically designed to boost the lower voltage from the solar array. The team has identified four modes of operations. One is charging mode during which the PV array charges the battery and the operation is monitored. The next two are operational with one a test mode and the other the run mode. In the test mode, the vehicle will be supported so all electrical and electromechanical subsystems can be evaluated without the vehicle in motion. In the run mode, the vehicle with be in motion with a driver. The final mode is shutdown which will ensure that the subsystems are transitioned to a stable state (e.g. battery) after operation. So far, we have worked on developing a model of the car and how we believe it should be tested when completed. This model is in the form of a MATLAB script where specific parameters can be changed at will. In that model, drag, along with lost energy through regenerative braking, is taken into account to determine how much capacity we need for the battery to go that distance. It also includes calculations that determine what power can be expected to come from the solar panels using the solar insolation values in Peoria, in May. It has been determined that we will use epa standard driving schedule. This will be adjusted to fit the specified two hour time period with eight stops included throughout. Due to the time constraints and lack of funds the end product for this years team is not to build a competition ready car, but instead to build a car with the ability to be upgraded. With that in mind, the following is a description of the potential additions and upgrades that can be made to the car. Aeroshell: With the completion of an aeroshell the car would be made more aerodynamic as well as give us much more surface area to mount a custom solar array. Upgraded Motors: Because the cost of high efficiency motors ($10,000) is well outside our budget, it is necessary to purchase lower cost, lower efficiency motors, affecting our energy consumption and shortens our drive time. By upgrading to the highest tier motors possible, we can go from a roughly 82% efficiency to 99% efficiency. As higher quality parts are installed into the car, it would be more realistic to reach the top speed of 60 mph. For this senior project, it is impracticable to reach this speed mainly because of the speed limit of the motors. Upgraded Batteries: If the motors are upgraded the battery pack must also be upgraded to supply the higher voltage for the more efficient motor. More cells could also be added to increase capacity for the much longer road race. Custom Solar Cells: Once the car is outfitted with a custom aero shell, custom solar panels can be constructed from better quality solar cells (Sunpower) that will allow the for maximum power generation. It would also allow the team to have the maximum amount of solar panel coverage allowed by the competition (4m^2). “Solar Energy and Solar Power in Peoria, IL.” Solar Energy Local, solarenergylocal.com/states/illinois/peoria/. “Affordable & Reliable EV Li-Ion BMS.” Orion Li-Ion Battery Management System, www.orionbms.com/. “Dynamometer Drive Schedules.” EPA, Environmental Protection Agency, 31 Jan. 2017, www.epa.gov/vehicle-and-fuel-emissions-testing/dynamometer-drive-schedules. Solarcar & EV Products | MITSUBA Corporation, www.mitsuba.co.jp/english/products/solarcarandev. “Kelly Controls.” Motor Controller | EV Parts - Kelly Controls, LLC, kellycontroller.com/. “GVB-8 (Boost) | 105-350W Solar Boost Charge Controller with MPPT for Lithium Batteries.”Genasun, genasun.com/all-products/solar-charge-controllers/for-lithium/gvb-8a-li-lithium-solar-boost-controller/. “All About Maximum Power Point Tracking (MPPT) Solar Charge Controllers.” Northern Arizona Wind & Sun, www.solar-electric.com/learning-center/batteries-and-charging/mppt-solar-charge-controllers.html. “BU-305: Building a Lithium-Ion Pack.” Regulations on Building a Lithium-Ion Pack – Battery University, batteryuniversity.com/learn/article/building_a_lithium_ion_pack. “How to Store 18650 Batteries Safely.” 18650 Battery | BATTERY BRO, batterybro.com/blogs/18650-wholesale-battery-reviews/77975750-how-to-store-18650-batteries-safely.